The Timex Ironman Run x20 gets the basics righ, even if that's all it does. But while it might not have the thrills and frills of other fitness wearables, it is effective and cheap. This is a stripped down, no frills runner's watch. And sometimes you just want a spade to dig a hole. Via GPS connection, the Ironman records real-time distance, pace, speed and calories burned. And that's it. It's not a Garmin Forerunner XT220 or TomTom Cardio, but then that's because it costs about £80 (US$80, AUS$190). That's not really a justification of its looks, mind. Our review model came in an athletic/icky shade of road-traffic-crew-bib yellow, although blue, pink and black options are available. But whatever the hue this not a watch to wear to any social situation other than a running club. I immediately broke the plastic ring the watch is presented on because I couldn't prise the strap open. This, it turns out, is because there's a lock-in strap tie that you have to pick open with a fingernail to release. Excellent for staying put while running but not so good for brittle, plastic packaging. Once on it's incredibly thin for a GPS watch and at around just 60g (1.7oz), pleasingly light. It feels quite plasticky – you won't mistake this for Swiss manufacturing – and is essentially a pop watch for runners. But if you're out on a hill-eating long distance run and are not built like Mo Farah, you want your watch to become invisible. This really does disappear. The Ironman is juiced up with a simple, crocodile clip USB plug that overbites down onto four charging points on the underside of the watch, which is unsophisticated but effective. One full charge gave me almost a week's performance doing one reasonably short run per day. Put more scientifically, a full juicing will deliver a six-hour life in full GPS mode. The screen is always on, but hard to see in bright light and impossible to see in low light. With five buttons, the Ironman is, however, as simple to use as a can opener. Top left is on/off and light, which shines decent LCD illumination on matters (it's still impossible to see in bright sun). Top right is stop/up, middle menu/enter, bottom right is start/split/down and bottom left is back/display. There are two modes to select: stopwatch, or intervals. Stopwatch is a straight run against the clock. Intervals allows you to set up interval training, with intervals of time or distance for running/walking or high/low intensity sessions, which you can name. For both, depending on if you set up mile or kilometre tracking, you get a lap recorded at each of those increments and a buzz on your wrist to holler such. You can also cycle through run stats on the go. Also on board is 50m water resistance, but the GPS doesn't work in the water, so… um. But that aside, there are no fancy sensors, no heart rate monitors, no gyroscopes or swish infrared cameras, just satellites, time, terrain and your wheezy plodding. Oh, and there's an alarm, too. As with most GPS watches, syncing to passing satellites is as quick as filing your tax online, and you'll only get a signal outside. On more than one occasion it just couldn't get a lock, leaving me so cold on the pavement I had to start my run and hit go when I eventually got the buzz of notification that it had eventually found an orbiting friend. So good luck if it's cold or raining. However, once hands are shaken with a satellite, the signal is strong and true. The only big drawback becomes apparent when you start piling on the runs, as you soon find out the Ironman has a surprisingly stingy ten-run memory, which feels like it's been hit by austerity measures. Honestly, each run saves six bits of info – run time, distance, minutes per mile, miles per hour, laps, calories burned – which must gobble up about a kb of memory a pop. Most competitors have Xboxes of memory, or sync to expansive and ostentatious apps recording millilitres of nose sweat. This has you reaching for a pen and pad before two weeks are up, when a quid's more memory would surely hold months of such basic data? Strange. And of course this syncs to literally no fitness apps. So no digital nagging from a smug iTrainer, then, but equally, if you want to keep track of your progress you're going to need a pencil and some paper. Imagine that, granddad! If you want a wearable rather than using your phone, this is a solid performer. If you have a reasonably modern smartphone, it will outperform this in just about every regard, but I suspect I'm not the only runner out there who is allergic to taking his mobile on jogging jaunts. 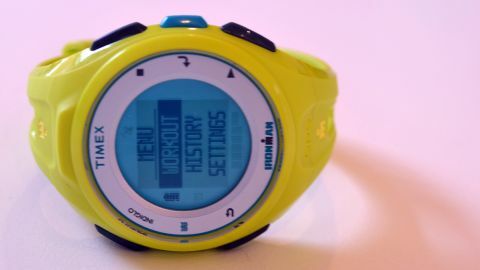 The best thing about the Timex Ironman Run x20 is that it's cheap, and because it's cheap it's plasticky, and because it's plasticky it's both light and robust. This might be a controversial call, given how aggressively un-techy the Timex Ironman Run x20 is, but I found it to be a pretty sound running watch that gets many of the basics right. Admittedly it only gets the basics right, and that's because it only does the basics. If you want a function-brimming device with enough processing power to launch a Space Shuttle, look up Garmin, Epson and TomTom. If, on the other hand, you're a casual runner just looking to keep an eye on your times with a view to up your performance, or ensure it doesn't drop off, and app association isn't a priority, this really could be the fitness wearable for you.